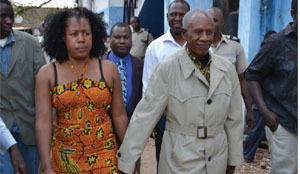 Veteran politician William Banda and nine other UPND members are expected to appear in court tomorrow for trial. Banda, UPND National Youth Spokesperson Gilbert Liswaniso, Hakainde Hichilema’s press Secretary Brian Mwiinga and others stand charged of obstruction of police officers when they tried to block the police from arresting HH on the 10th April 2017. Trial is expected to start tomorrow morning at 8 hours at Lusaka Magistrates Court. It is alleged that Banda, Mwiinga Liswaniso, John Kalimunwa, David Mwanza, Abraham Zulu Rashid Masumba, Dean Mwaanga, John Lungu and Micheal Tembo on April 10 jointly and whilst acting together willfully obstructed police officers during the execution of their duties. Banda and others and others pleaded not guilty hence the commencement of trial tomorrow. But a nolle prosequi is possible given the nature of these fake charges.